Remarks The parts are available in rent regime. Contact with the publisher. 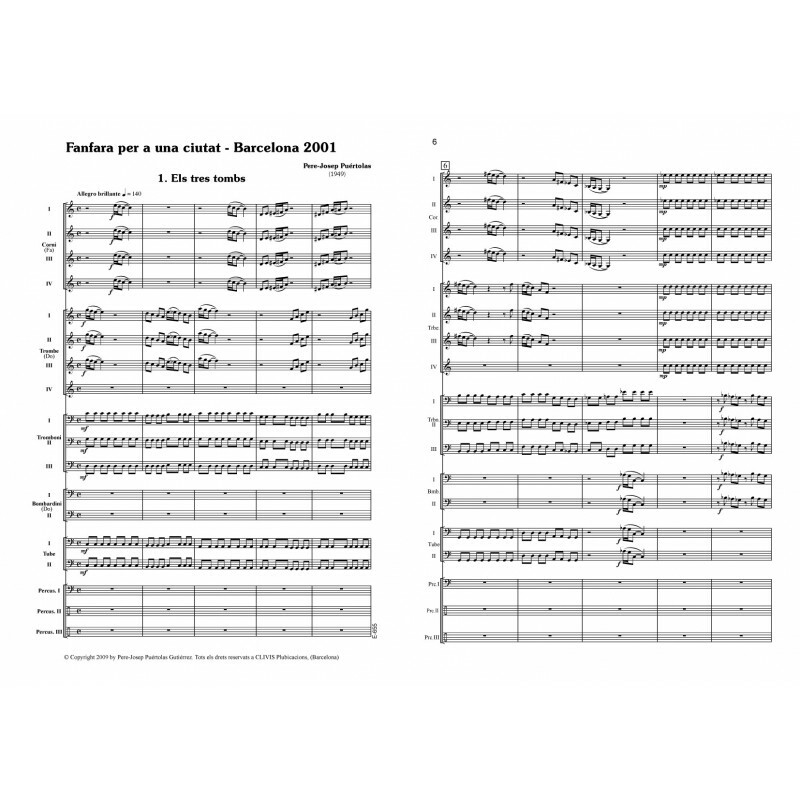 Fanfara per a una ciutat -Barcelona 2001- (Fanfare for a city -Barcelona 2001-) is a piece that was written in 1997 for brass and percussion. It was first performed at the Palau de la Música Catalana (Catalan Music Palace) on 28 February 1997 by the Orquestra Simfònica de Barcelona y Nacional de Catalunya (Barcelona Symphonic and Catalan National Orchestra). The work was commissioned by the orchestra itself for the presentation of Barcelona’s candidacy for European Capital of Culture 2001. Initially it was going to be performed outdoors at the Auditori de Barcelona (Barcelona Auditorium), which was still under construction at that time. This conditioned the choice of instruments and the nature of the work, which was structured in five short, contrasting movements relating to the arts and culture of Barcelona. The first movement, Els tres tombs, represents Literature. The second movement, Casa Milà, represents Architecture, going beyond the work of Gaudí. 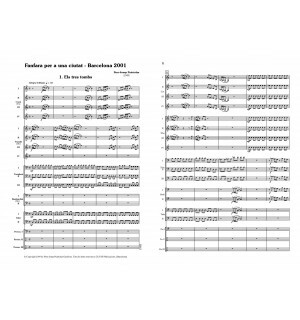 The central movement is a little playful scherzo entitled el Patufet in tribute to the children’s magazine of that name, which was so influential in Barcelona in the first half of the 20th century. Sculpture is represented in the fourth movement, Dona i ocell, which is named after the work by Joan Miró. It is in this movement that the most lyrical part of the piece develops. Finally, Painting is represented through Ramon Casas’ painting La càrrega, which provided the inspiration for this bright, energetic movement that ends the piece.